Home › Forums › Practice & Advice › Digital Drawing or Traditional Drawing or both? This topic contains 9 replies, has 7 voices, and was last updated by Jbtyst 2 weeks ago. I have a drawing tablet but I also want to draw with my hand. I am much better with my hand. Can you guys give me advice, I would love to be good with both. How much should practice each every day? Should I just stick to one? Sorry if somebody else asked this already. The easy answer is to recomend practicing both, either splitting your practice sessions into two (drawing tradittionally for the first half, then digitally for the second half) or alternating between the two every other practice session. Using a drawing tablet is it’s own skill and as you might have experienced, being able to draw well on paper doesn’t translate perfectly to the digital world. However, I think the best way to decide how to practice would be to figure out what your artistic goals are. What kind of work inspires you? Is it traditionally rendered or is it digitally made? Do your goals include branching out to other mediums like painting, animation or comics? Basically if you have an idea of the kind of work(s) you want to create going forward, it’ll be easier to decide how important working digitally is. Also, in terms of how much time to practice, it sort of depends on how much time and stamina you have in a day. Honestly it’s better to draw consistently, even for just 30mins a day then have long but irregular sessions. How much do you draw currently? First of all, thank you a lot for this reply. This is some of the work that inspires me design wise, most of it looks digital too me. I also very fond of Anthony Jons, Chat Zar, Alex Gray. 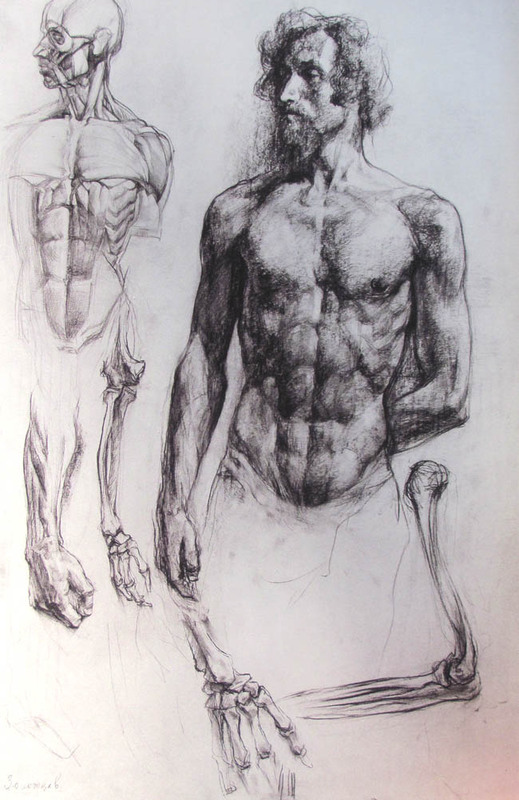 I am would like to achieve the level of these anatomy studies I think it is necessary. I am interested in character design, anatomy, comic book illustration, probably a comic book somewhere in the future. I would like to imagine my own characters, design them with relativly realistic detail and then 3d model them, print them and then paint them. (for now this is my end goal). At the moment I am able to give 30 minutes-1hour a day of work(it depends on the day). When I think about the end goal, I don't have a specific date at mind when I want to be at that level. But I am here asking for advice because I do want to be there as fast as possible. Definitely looks like you’re headed in a digital direction! There’s nothing to say you can’t combine hand drawing and digital workflows either, such as doing the base sketch by hand, scanning it (or snapping a pic), importing it and then doing a digital painting overtop. In the case of comics, you could sketch by hand then ink and colour digitally. I think I would suggest alternating the use of the tablet every other drawing session. As a suggestion, you could draw by hand when doing anatomy studies, which would allow you to focus on the study and draw accurately without having to fight to get the lines right as you might with the tablet. On alternating days, you could focus on rendering by following along with some digital painting tutorials on YouTube to continue improving those skills. That way you can focus on separate, but complementary skills, without having to choose between one form of drawing or the other. Hope that’s of some help to you! I have tried my hand at digital and I just do not like it. It loses the tactile reaction that I need. My mediums are oil, pen and ink, and graphite. And I practice in different ways. I do life drawing in Graphite weekly. I do 10 minute daily practice in pen and ink. I go to oil when I really want to just dig in and work on something long. And then when I feel inspired to do a longer image I feel out what is right for me. So I would reccomend set up consistent rhythms around practicing in your preferred mediums. And if one medium leads you toward one style and the other medium another style. Follow it. Maybe do a morning practice session as part of your daily routine. And if digital is what gets you moving because the minimal set up, do that. Or if setting up the computer and getting the tools together slows you down, but a sketchbook and pen or pencil gets you started. Follow that. But I strongly reccomend that you create a pattern of practice that works for you. If you want to see how that worked for me you can see my work on Instagram on Hornet.c.a or FB under Hornet Of Justice Art. My insta feed shows you how I move through the mediums focusing on each for a time. As some who's learning to draw basically exclusively on a tablet, I think it's also worth considering what programs you want to practice on for the digital stuff. Things like PhotoShop and Krita can handle more painterly styles, while other programs are more suited to lineart. Also, you'll save a lot of storage space if you practice at lower resolutions than you'd use for a finished piece. The Pinterest board up thread looks fairly digital, but it’s also quite similar to the kind of art Wizards of the Coast commissions for Magic the Gathering, or that SFF houses like for book covers. And practically speaking, that means even if the exact pieces on the board are all digital, the artists were inspired by artists working with physical art materials. Most magic cards have an actual physical painting for the card art. (Seriously, Magic cards or Pokémon or Yugio or whatever cards are an art education ok?) There’s some book covers that are photos or all digital, but the average still is a physical painting. Comics and manga usually start out on paper, with pencil. You can (and many webcomic artists do) work digital for the sketch/pencil stage, but stuff that gets published by a big imprint probably started on paper. The covers are usually physical paintings. The color inside is probably digital. The ink might be digital or physical. The way you mentally take a picture apart to try to imitate it is the same no matter how the artist worked. It works just as well on Dürer ink drawings and Studio Ghibli watercolor concept sketches as on Loish all digital stuff. I've been drawing/painting with Photoshop and Corel Painter for decades.... However hubby just bought me an Ipad for easy transport - Not used to Procreate yet but I'm sure I will get the hang on of it.. I just wanted it to practice sketching... and then transfer it to the big daddy computer and finish it off.. I plan on practicing 7 days a week. I look at it as a lifestyle not a goal. I've been drawing since before I could walk ..
Tara edited this post on April 2, 2019 5:57pm. I think that digital creation should not replace traditional creation. It's just another medium. I use my ipad with Procreate or Adobe Sketch but my approach is similar to the traditional. I finally only use 2, 3 brushes and these brushes look very much like the traditional look. The good thing with an ipad (for example) is to move where you want without having to take out all the material. It is convenient but it will never replace the traditional.